Vegan Protein for people who want the very best. Our vegan alternative will help you develop your muscles' full potential. We have created the perfect vegan companion for sports and everyday life in our innovative plant-based protein formula. For those who trust in the power of plants. 4 sources. One effect. Made for performance. Contains 4 times as much L-arginine as traditional whey. No trypsin inhibitors - for optimal bioavailability. Just as rich in BCAAs as whey protein. High-quality nutrients - for a delicious taste. Protein shouldn't just enhance performance - it should also taste good. Chocolate, Strawberry or Vanilla - steviol glycosides underline the taste of our Vegan Protein and deliver delicate sweetness. No sugar, no calories. For the perfect shake. Our Vegan Protein. In a class of its own. Plant protein concentrate and isolate with sweetener for the preparation of protein drinks. 1 Nutritional values will differ when a base other than water is used. Mix 30 g (approx. 3 lightly heaped tablespoons) of Vegan Protein with 250 ml of water or plant-based skimmed milk substitute. Fill the shaker with liquid first, then add the Vegan Protein powder and shake well for 20-30 seconds. For best results drink 1 shake a day right after training or first thing in the morning. Our Vegan Protein provides high-quality protein and valuable essential amino acids. That is why our protein is particularly beneficial for vegan weight lifters and endurance athletes and promotes muscle building as well as improved muscle regeneration. Trying to find suitable proteins for allergy adults and kids has been tough, but am absolutely ecstatic to find a vegan protein that tastes great. Highly recommend. I enjoy this protein shake. This is ideal for me as an athlete to drink after practice and helps to secure my protein intake as a vegan. I am vegan, love to run, and have been looking for a protein source like that for a really long time. Can't believe I finally found one. It's perfect. I was so pleased with this vegan protein. It tastes good and I will definitely buy it again. Who should use Vegan Protein? In recent years, various diets have been developed and have established themselves as diets for a more health and nutrition-conscious lifestyle. One of the most exciting developments can be observed in the field of plant-based nutrition. Increasing numbers of athletes and health-conscious individuals are adopting a vegan lifestyle, including one of the strongest men in Germany and a very successful ultra-marathon runner. 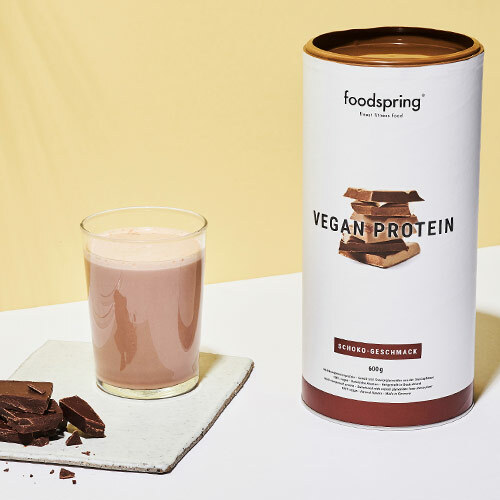 foodspring has developed a vegan multi-component protein - a purely plant-based protein powder, which matches the specific requirements of vegan athletes and suits anyone, who prefers plant-based diet alternatives. The special combination of pea protein, rice protein, hemp protein and sunflower protein ensures that the Vegan Protein by foodspring provides ideal coverage of all the essential amino acids. In terms of organic value, therefore, Vegan Protein doesn't have to hide behind its animal-based counterpart Whey Protein. 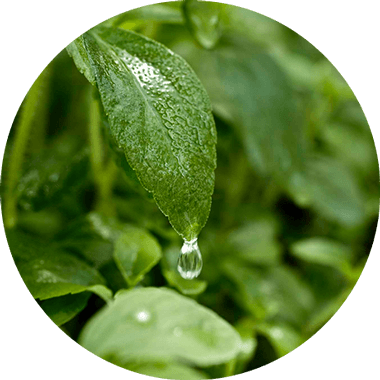 And for an extraordinary taste sensation, we use steviol glycosides, purified extracts from the stevia plant for added sweetness.. Many vegan proteins are limited to a single plant-based protein source (e.g. rice or hemp protein), resulting in a limited efficacy spectrum. These products often don't score very highly in important assessment criteria like organic value or protein content per 100 g. It gets even worse when it comes to flavour. Plant-based protein powder from a single source is often unpalatable and artificial flavourings have to be added to make them edible. Vegan Protein by foodspring contains only premium-quality raw materials and is made in Germany in compliance with the highest quality standards and production guidelines. Vegan athletes also need a protein-rich diet to ensure top muscle performance. The body must be sufficiently supplied with essential amino acids for muscle building, maintenance and optimum performance. While meat, eggs and dairy products often display amino acid profiles similar to that of humans, the amino acid profiles of plant-based foods are not always as complete as an needs them to be for full coverage. That's why it is important to combine dishes intelligently as part of a plant-based diet to ensure a sufficient supply of all the amino acids. Vegetarian and vegan athletes have all they need in our foodspring Vegan Protein. The special combination of four premium-quality plant-based protein sources creates a complete amino acid profile and achieves a protein content of over 70 g per 100 g powder. Below you will find an overview of the effects of the individual plant-based protein sources in our Vegan Protein. The amino acid L-arginine is represented in our Vegan Protein with more than 7 g per 100 g powder. L-arginine is specifically responsible for nutrient transport in the body and can therefore ensure a fresh energy boost for weight lifting or endurance training. The L-lysine content in pea protein is another interesting factor for health-conscious people. Lysine is one of the essential amino acids and therefore has to reach the metabolism via food, as it cannot be manufactured in the human body. Lysine is involved in processing and supplying calcium and therefore important for strong, healthy bones. Pea protein is also a valuable source of iron. Just one portion of our Vegan Protein can cover up to one third of your daily iron requirements. Iron deficiency is one of the most common mineral deficiencies in both men and women. Frequent fatigue symptoms or lapses in concentration can point towards an iron deficiency. Iron is also involved in transporting oxygen in the blood stream and plays an important role in the enzymatic processes of the body. Combining rice protein and pea protein has allowed us to create a complete amino acid profile with all the essential amino acids for top physical performance. Rice protein also contains more than 80 percent protein and provides essential micronutrients like vitamin E and vitamin B, as well as the minerals iron, zinc and magnesium to enhance physical performance. The natural fermentation process of the rice protein ensures the nutrients can be optimally absorbed by the body. The high fibre content in rice protein also activates the body's intestinal flora. That is why we can offer a rice protein component in raw food quality. Hemp protein, extracted from the hemp plant, is an excellent source of plant-based protein. Hemp protein is characterised by its high omega-6 and omega-3 fatty acids content, which are a meaningful addition to the nutrient profile of our Vegan Protein. These polyunsaturated fatty acids are crucially important for the health of your cardiovascular system. Hemp protein also provides minerals like potassium, magnesium and calcium. These are important for a healthy bone structure and top muscle performance. The full effect of the nutrient profile is completed with phytochemicals like chlorophyll and phytosterols. Hemp protein contains less than 1% tetrahydrocannabinol (THC) and therefore displays no psychoactive effects. Sunflower protein perfectly complements the other 3 components in our Vegan Protein. Due to its high folic acid content, sunflower protein is of particular interest for pregnant or nursing women. Sunflower protein also offers a near-complete vitamin spectrum of the vitamins E, D, K, B, A and F. Sunflower seeds are therefore closely linked to cardiovascular health and promote normal bone growth. Protein shakes are best taken right after physical exercise. Especially after training, muscles need important protein elements to effectively carry out development and repair processes. An intake of our Vegan Protein after training covers all of the body's essential amino acid requirements, creating an anabolic (muscle building) environment for your muscles. Our Vegan Protein is also a great choice for a protein-rich start to the day. In the morning, our bodies are particularly sensitive to the absorption of nutrients like proteins and can use these for positive muscle performance. In conjunction with other plant-based products, our Vegan Protein can enrich a sporty lifestyle. Your best choices are amino acids which support training, like BCAA capsules (muscle maintenance), arginine (power & endurance) and glutamine (regeneration). A high content of amino acids like leucine, isoleucine, valine and arginine make our Vegan Protein an excellent choice for vegan muscle building. The sufficient supply of protein elements for building new muscle mass should be a priority in any muscle building diet. The high L-arginine content in particular is an additional benefit of our Vegan Protein for muscle building. L-arginine promotes nutrient transportation in muscle fibres and therefore actively enhances power and endurance during training. One portion of Vegan Protein provides the body with about 20 g of high-quality protein elements. This can be a valuable contribution to the recommended protein intake of 1.5 g per kilogram of body weight. That is the amount of protein recommended by the German Nutrition Society (DGE) for successful muscle building. Vegan Protein is an ideal companion for all those, who want to consciously avoid animal-based foods, but still want to have a high-quality protein powder for their daily protein requirements. It is of particular interest for vegan athletes aiming to build muscle or for those with a physically strenuous job. One special feature of the Vegan Protein by foodspring is its hypo-allergenic certification. It is therefore perfectly suitable for people with allergies or intolerances to dairy products, eggs, gluten or soya. Most vegan proteins on the market use one single raw material basis (e.g. rice or pea protein). This one-sidedness has a negative impact on the product’s biological value. Combining multiple plant-based sources of protein significantly improves the biological value and creates a complete amino acid profile. 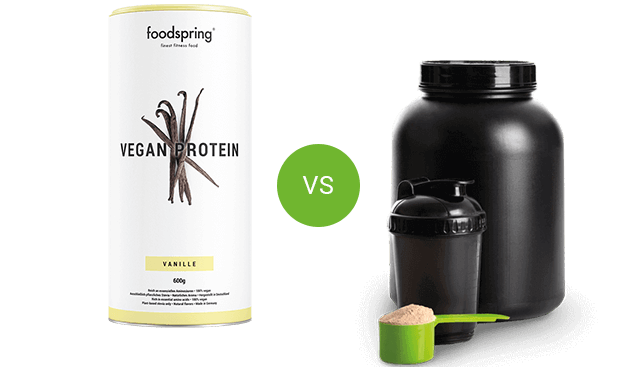 Our foodspring Vegan Protein is therefore right up there with whey protein in terms of bioavailability. The protein content of a vegan protein product should also be at least 70 g per 100 g powder. Some plant-based protein sources have a protein content of just 40 - 50 percent. Ideally, a vegan protein should be organically processed and free of artificial additives. High-quality vegan protein is made exclusively in Germany and in compliance with strict production and hygiene standards. Our vegan multi-component protein with a protein content of over 70% is available right here in our online shop. Why do you use wild rice, pea, hemp and sunflower? The combination of these four high-quality plant-based protein sources creates very high organic value. We also combine the benefits of the individual protein sources to achieve a complete amino acid profile containing all of the essential amino acids, e.g leucine, isoleucine and valine. Should I be concerned about my digestion? Our Vegan Protein combines four high-quality plant-based protein sources with a supplementary amino acid profile. Unlike whey proteins, Vegan Protein is lactose-free and hypoallergenic. This makes it is very easy to digest and provides the body with valuable proteins both quickly and long term in an even supply. Why don’t you use soya as the base for the Vegan protein? The combination of different protein sources allows us to create a complete amino acids profile and also stay true to the principles of a balanced diet. Vegetarians and vegans in particular use soya as an alternative to animal products. That’s why it makes sense to use alternative plant proteins as a source of daily protein. Moreover, soya contains phytoestrogen and is suspected of causing major changes in hormone levels Our soya-free Vegan Protein is a complete protein that works without hormones and can contribute to a balanced diet for athletes. Should I be worried about allergies? Vegan Protein is hypoallergenic. This means it contains no soya, lactose or nuts, making it suitable for people suffering allergies. However, due to production conditions, trace elements of all three allergens may be present, as stated on the packaging. Anyone suffering from severe allergies should first consult their doctor before consuming Vegan Protein. Vegan Protein will be back in stock shortly.